Ships from and sold by Northern Shipments. Comment: Ships Internationally. Great Book! Recent critiques of the foundations of liberalism from communitarian, socialist, postmodern, and other philosophical circles have served to remind liberals of several problematic assumptions at the heart of liberal doctrine from its inception to the present day. Such critiques necessitate a rethinking of the foundations of liberalism, and in particular those regarding the self and rationality that liberal politics presupposes. 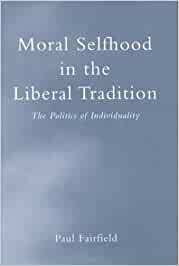 Beginning with a wide-ranging discussion of liberal philosophers - including Hobbes, Locke, Kant, Green, Mill, and Rawls - Paul Fairfield proposes that liberalism requires a complete reconception of moral selfhood, one that accommodates elements of the contemporary critiques without abandoning liberal individualism. The model that emerges is one of situated agency - of a historically and linguistically constituted being who is never without the capacity for individual and autonomous expression. Fairfield defends a narrative conception of moral selfhood in the tradition of phenomenological hermeneutics, one that affords a proper vantage point from which to support and interpret liberal principles. Paul Fairfield is a Postdoctoral Fellow of the Social Sciences and Humanities Research Council of Canada.